Another day , another cheese fondue. It is going to seem like this tasty dish is all I eat because the last resto I reviewed featured this deliciousness as well. Just lucky, I guess. But the similarity stops there. This experience was entirely unique. The Melting Pot is a chain of fondue restaurants that you may have seen or tried while visiting the U.S. Canada just opened two locations and we are lucky to have one of those locations in the GTA. I headed to The Melting Pot to celebrate a friend’s birthday and it was a night to remember. The Melting Pot is located in the hub of restaurants at East Beaver Creek and Highway 7. If you have ever been to that complex on a Friday or Saturday night you know that parking is an issue. If at all possible arrive early. But, if you are headed to dinner any time after 7 and are driving , prepare for mission impossible…finding a spot. Once we completed the trek from our car , we entered the restaurant. It is a modern, spacious building with low lighting and clean lines. There is a wine room near the host/hostess station as you walk in that would be a feature of my dream home. We were seated in a strip of two-seater tables that the staff affectionately refers to as “Lover’s Lane”. This would be a very romantic setting for a date. I actually enjoyed sitting here with a friend too, as it was private and cozy. This is a very good thing as we were going to be there a while. Our server was very welcoming and exceptionally knowledgeable about the food and ingredients. She explained the menu patiently and extensively , as ordering options were complicated. Other staff were also attentive and helpful. They were often clearing dishes, filling water and adjusting cooking temperatures for us. The owner of this Melting Pot restaurant is Corbin Tomaszeski, or Chef Corbin. Chef Corbin has been featured on a number of television shows such as Dinner Party Wars and Restaurant Makeover. When we inquired about him , our waitress sent him over and we chatted for a bit. He was friendly and seemed to have a genuine interest in his customers and their experience at The Melting Pot. 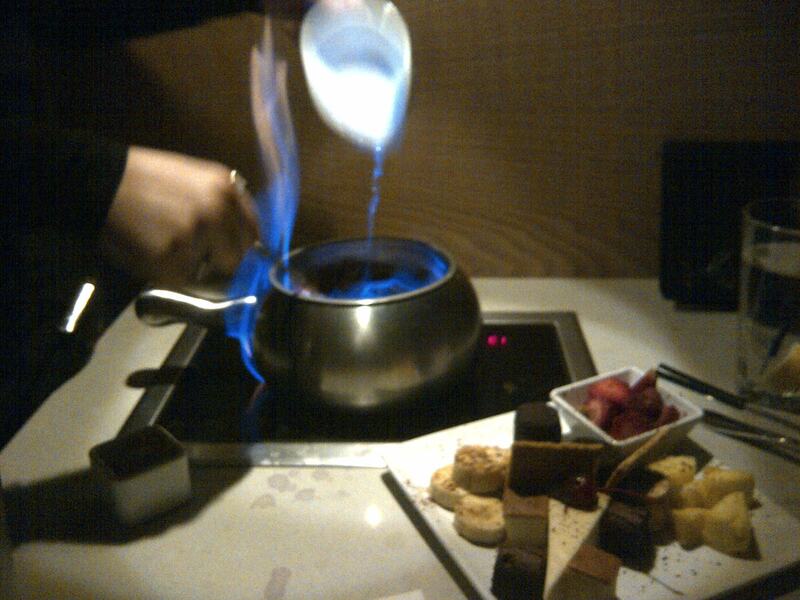 The Melting Pot specializes in fondue. For those who may not be familiar, fondue is a dish in which small pieces of food are dipped or dropped into a hot sauce or cooking medium. 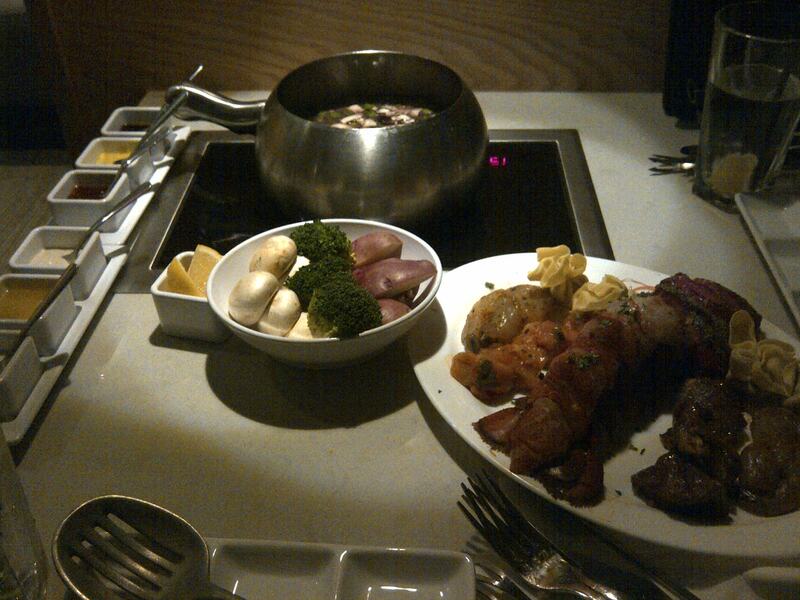 The Melting Pot features broth, oil, cheese and chocolate based fondue. The menu can get complicated. Luckily staff do a great job of explaining it. Fondue can be purchased a la carte style, or you can select a Four Course Classic meal. The Four Course Classic includes a cheese fondue, salad, broth or oil entrée fondue and a chocolate fondue. There is also a Big Night Out option that is very similar to the Four Course Classic except it is American themed. This is very odd and rather disappointing for a Canadian location. On top of The Big Night Out and Four Course Classic, there is also a Fondue Features menu with seasonal specialties that you can choose from. You can substitute other cheese or chocolates for the Big Night Out menu. For both 4 course options, it is the entrée that you choose that determines the cost. Still with me? We chose to do the Fondue Fusion option on the Big Night Out menu. It can be confusing. I would much prefer if they scrapped the Big Night Out menu insert and just had customers choose a cheese, salad, entrée and chocolate since they are all interchangeable and that is what you end up doing anyway. 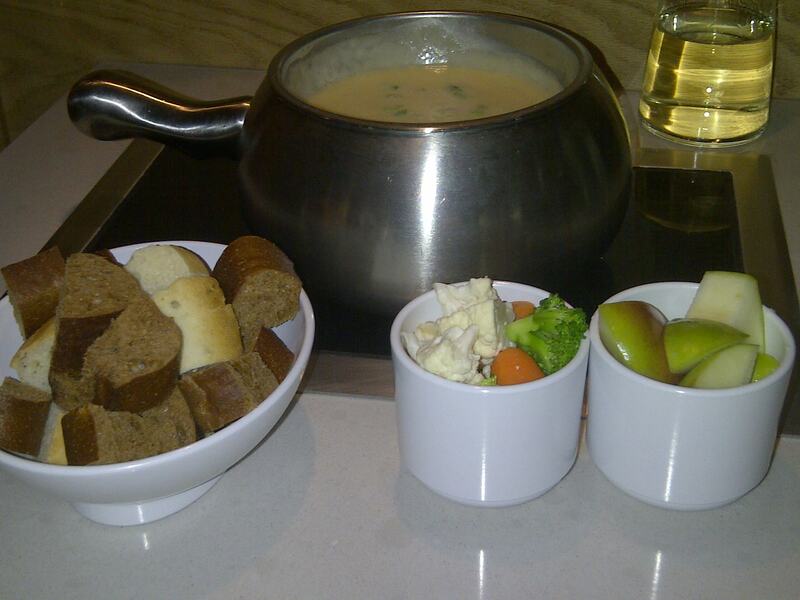 We began our meal with a cheese fondue called Wisconsin Trio Cheese Fondue. In this fondue rich fontina, butterkäse, and buttermilk bleu cheeses are mixed with scallions, white wine and a hint of sherry. Our server brought all of the ingredients over and made the fondue from scratch at our table. It was great ( and mouth-watering) to see exactly what was going into the dish. Bread, vegetables and apple were given for dipping. You definitely have to enjoy bleu cheese for this dish as it’s unique and pungent taste was definitely present. It was smooth and delicious and paired especially well with the bread and green apple. It was tricky to dip the veggies as they were cut very small. Next up was the salad. I chose a house salad which was very tasty. I particularly enjoyed the wine and garlic Melting Pot seasoning that is suggested for a salad topper. My friend Melissa, choose a Caesar salad. While also tasty, she could have done without the sweetened pine nuts served on top. The entrée that we choose included season angus sirloin, cold water lobster tail, shrimp, buffalo chicken, memphis-style bbq pork tenderloin and wild mushroom sachetti. A platter of these arrived at our table along with our broth of choice, Coq au Vin ( burgundy wine infused with herbs, spices and mushrooms), and some vegetable accompaniments. This was a great selection meat and seafood. Our server also provided a flight of sauces and suggested pairings for them. These included curry, gongonzola port, terriyaki and butter for the lobster. We were given some nifty plates with space to put each sauce without them touching. We were told about cooking times ( nothing requires more than 2 minutes) and left to chow down. Our favourites were definitely the sirloin and lobster. But , it was all delicious and well seasoned. Last but not least was the dessert course, chocolate fondue. At this point we were full , but where there is a will there is a way, We still managed to have a good bit of the S’mores fondue we selected. Our server flambeed chocolate with marshmallow fluff at our table and left us with cheesecake, strawberries, pineapple, pound cake and marshmallow for dipping. The melting pot experience can be pricey. However, diners do not have to go all out with the four course meal , and wine like we did. Lots of people just have cheese and chocolate fondue when they stop in. The fondue fusion entrée that we choose was $112 per couple. The quality of the cheeses, seafood and meats made this understandable. All in with a half litre of wine , the meal set us back $179. This is steep but the all out Melting Pot Experience is ideal for special events, or infrequent indulgence. For quality of ingredients and a unique experience, I’d say the cost is right on point. The Melting Pot was unlike any dining experience I had ever had . Cooking fondue style was fun and interesting. The friendly staff being so knowledgeable and making dishes at the table was a nice touch. The dinner took about 3 hours, so be prepared to sit back and indulge. I would highly recommend this restaurant as it was not just a meal, but a unique fondue experience. If you have dined at The Melting Pot ( either here , or in the States) , what did you think? We regret to announce The Melting Pot of Richmond Hill is closed for business as of Tuesday, March 12. The Melting Pot Restaurants, Inc. hopes to either re-open the Richmond Hill location or open another location within the Greater Toronto Area in the future. Please visit http://www.meltingpot.com/locations for more location information. We sincerely appreciate your patronage over the past year. I could use a fondue feast right about now! Although I haven’t yet been to the ones here in the GTA yet (hint, hint my friends!) I have been to the one at the Galleria Mall in Buffalo. In fact, we like it there so much (especially the service that we get from our favourite waitress Julie!) that we make it a point to always dine there when we go for our mini-breaks. I have to disagree with Melissa though…the pine nuts in the Caesar salad are my favourite part of the meal! P.S. You got to meet Chef Corban…awsomesauce!! I guess Ill just have to go back again to try the Caesar Salad! You’ve got to do what you’ve got to do , right? Thanks Kath! Thanks to this review and my curiosity of how this location compares to the Buffalo one, I checked out The Melting Pot. I have to say that your review was spot on (pun intended!). The weight staff was friendly but a little less than enthusiastic and energetic. The food was good but the dessert is a bit different (no Rice Krispe Squares?!) and there were only 4 pine nuts in my salad! There are rice krispie squares in the States? Yum! That would be delicious in chocolate fondue. It is so interesting how a server can make all the difference in an experience, isn’t it? Thanks so much for coming back to share about your experience at the Melting Pot! Thanks for the review! I literally just saw this place over the weekend and was curious how it worked. Thanks so much for reading , Anita! Its a great resto and a fun experience. Definitely try it out if you get a chance. It is So delicious. I know you would love it.Im ready to go back anytime! Mmmmm great review!!! Informative !!!! !